Creamed Brussels Sprouts. 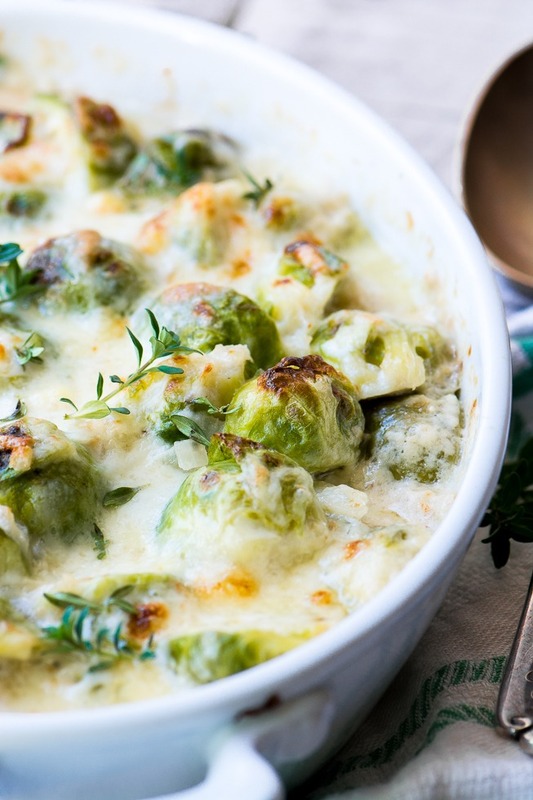 This luxurious cheesy gratin will convert everyone at the table into raving Brussels sprout fans! Rinse the sprouts and trim off the stems. Slice in half. If you have large sprouts, quarter them. Bring a big pot of salted water to a boil. Add the sprouts and boil for 3-4 minutes. Drain and immediately plunge in ice water to stop the cooking and set the color. When the sprouts are no longer warm, drain. Melt the butter in a skillet and saute the shallots for about 5 minutes. Add the flour and cook, stirring, for another minute, don't brown it. Add the Marsala wine and stir well. Cook for another minute or so until the wine is absorbed. Add the milk and cream and whisk the sauce until smooth and thick. Take off the heat and blend in one heaping cup of the cheese until completely melted. Add the nutmeg, salt and pepper to taste. Add the sprouts to the cheese sauce and mix well. Turn it into a standard 8x10 gratin dish. Cover loosely with foil and bake for 30 minutes, until bubbling. Sprinkle on the remaining 1/2 cup cheese and put under the broiler until the cheese is melted and browned. Sprinkle with fresh thyme leaves before serving.